Here's a shout out to all the teams of two and four leggers who recently started classes at See Spot Grin. Thanks for trusting us with your dogs. We're glad you're here! Help us welcome them. If you see a new face, be sure to introduce yourself! There's still time to register for September's photo shoot! See Spot Grin is excited to offer pet portrait sessions with professional photographer Cindy Knowlton, featuring a monthly theme to showcase your furry friend’s beauty and charm. Simply register and pay your sitting fee online, bring your dog at the time you selected, and then wait for an link to your downloadable images to arrive via email. * Let us capture your Spot grinning! No additional fees apply. Only one well behaved dog per appointment. A sit or down stay is required. You’ll receive 5-10 images to use as you wish. See Spot Grin is pleased to be hosting one of the K9 Nose Work founding members, Barb Schwerdt, who will teach you more about Hide Placement and give you fresh perspective on you and your dog's nose work performance. Click on the links above for details. Space is limited! Hope you can join us! Happy Birthday to these Grinners! We hope your birthday is as special as you are! You've seen her videos and now you can see her live! See Spot Grin will be hosting Suzanne Clothier on November 3-4, 2018 for Hand & Paw: A Shared Journey to Individual Solutions. Click on the links above for details. You won't want to miss it! In case you haven't heard her speak, this is a small snippet of what you can expect, and is being shared exclusively with Grinners. If you no longer wish to receive the See Spot Grin Newsletter please let us know so we can remove you from the mailing list. Thanks to all who have left reviews on the See Spot Grin Facebook page! We’d love it if you’d let others know why you’re a Grinner. Share your experience on Facebook. Click on "Reviews" on the left hand side of the page when you get there. Let others know why you're a Grinner. Are you a Continuing Nose Work student who recently missed a class? Did you know that you can attend any other Continuing Nose Work class time to make it up? Have a look at the schedule, then email us to let us know when you'll be coming. 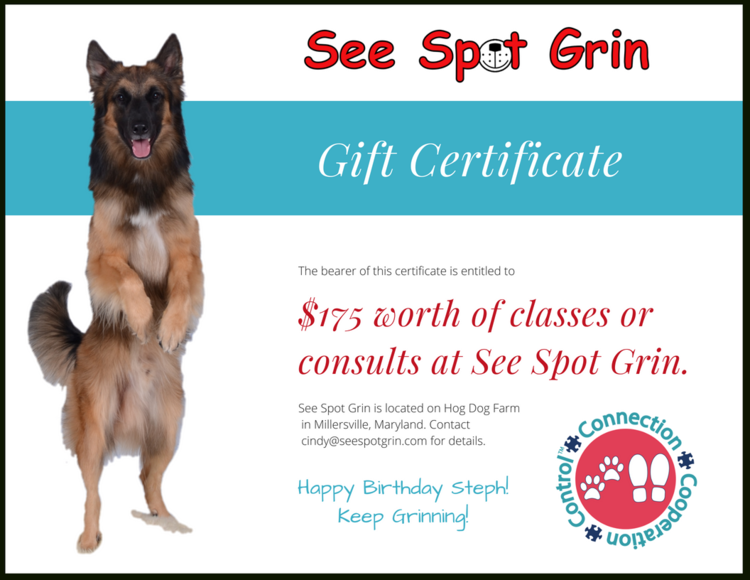 A See Spot Grin gift certificate is a great way let someone know how much you care. Get a friend off to the right start with their dog, or just say thanks to someone who's already there. All denominations available. Purchase yours here. 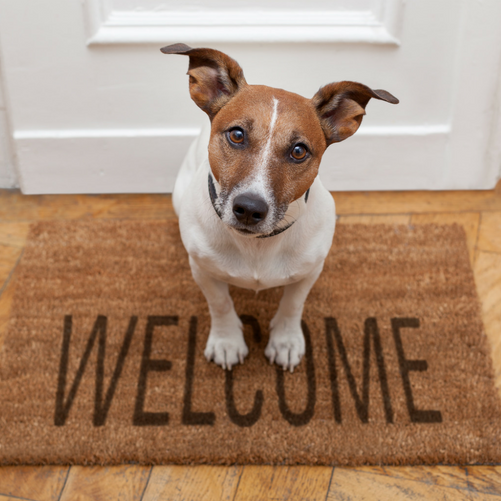 Looking for some guidance to help your dog through a specific behavior problem? We can help! Did you know that See Spot Grin has an app? Keeping up with our happenings is only a click away. Give it a try! Build your own puzzle station and give your dog the gift of a happier, heathier life. He’ll thank you for it. Our Resources Page is chock full of great info that can help you in ways you might not expect. Check it out! Share your experience with See Spot Grin on Facebook. Click on "Reviews" on the left hand side of the page when you get there. Let others know why you're a Grinner.